As noted in a previous post, I’ve worn the Can Cans for thousands upon thousands of steps over the course of a decade. They are very sturdily made and have been the most wearable shoes I’ve ever had. I’m looking forward to the look once the Renoirs have been broken in, and I anticipate that they’ll win the wearability contest. They appear almost equally well made with the Can Cans looking just a bit better in some way that I cannot put my finger on. Thicker leather? Something about the construction? It is a tad difficult to compare with the Renoir pair practically unworn yet too, but I have hopes that they’ll fare well over the years. Nearly $200 for the Renoirs is pricey indeed, but I generally select shoes in that price point. Seeing them in person I have no complaints about the cost at all. In fact, they are a bargain compared to nearly $500 for the Can Cans. So, there you are: my thoughts on these two beautiful Victorian/Edwardian-ish boots. I hope that seeing “after” photos of the Renoir boots may be interesting to someone even if they aren’t truly broken in yet. I was scouring the internet for reviews and images that didn’t look the same as the pristine pairs on the original website. I hoped to see them after buttons were adjusted and after conforming to someone’s feet. Most of the original boots I’ve seen have a gorgeous shape which the Renoirs are lacking, but I’m not sure if that might change with more wear and button adjustment? Perhaps anatomy and tolerance of discomfort have something to do with it too? 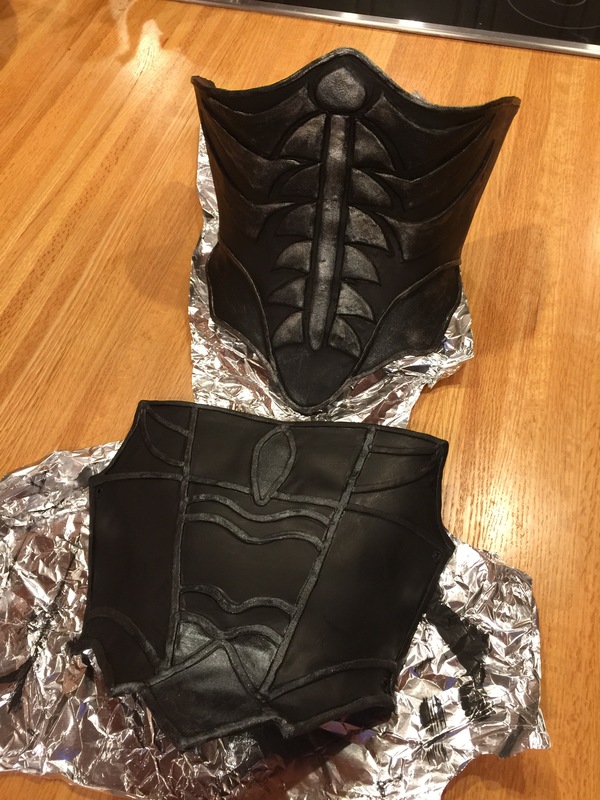 Or did the leather shrink? I don’t know. I love these curves! Will the Renoir boots approach this look after a while? I hope so and will report back some day to let you know. PS: I was able to get the most lovely little folding button hook! A funny thing is that although I am a rather ambidextrous-leaning lefty it was much more natural to hook with my right hand. I was surprised at how easily it went with my right while my left fumbled a little. Maybe that is since my left is used to the idea of buttoning normally? Heh. Today Yesterday I was staining the west side of the house, and I heard the mail carrier scan something. Ooh, a package! I’d been wondering if a button hook might arrive today (even though it is coming all the way from England) if I were lucky, but when I spotted a box by the door it was rather large. Then I saw the sender was American Duchess with L as the recipient. Surprised, I carried the parcel inside and tore into it, because I knew the Renoir boots were on pre-order and supposed to ship in 6-8 weeks! I didn’t figure I’d get to see them until nearly Christmas. Perhaps he had ordered another shoe as a surprise? After all I’d emailed him a short list detailing my desires. 😀 Shockingly it turned out to be the Renoirs after all! I’m giddy with happiness about these boots. Seriously. When I was a kid I was in love with all things from the 18th and 19 centuries. My focus shifted from time to time, but I especially was fond of the second half of the 19th. I taped Dr Quinn, I read American Girl and the Little House books, and I watched the Shirley Temple version of The Little Princess quite a few times. So, at some point I noticed high button boots and became obsessed. Later, when I spotted impossibly tiny Victorian boots in antique malls I wished so badly that I could fit in them (although of course they likely wouldn’t survive being worn.) I never really dreamt that some day anyone would offer brand new, real, buttoning boots for purchase. I’m not even sure why it didn’t occur to me since plenty of 18th century reproduction shoes are available now, but I sure never saw button boots anywhere and assumed that the buttons themselves were the reason. The nearest style, which I do love thought they lace up, are Capezio dance boots that they named Can Can. They are extremely comfortable, well made, and durable, but my feet grew in the 10+ years that I’ve had them. Unfortunately they are now only custom made, and I found the Renoir boots before L committed to getting me a new pair as a birthday present. Yesterday I nearly finished this post but decided to wait until I could add the button moving process before and after etc. I’m sure that the boots will evolve in their fit with time, but moving the buttons was pretty dramatic. They still do not have the amazing curves of the real deal, but maybe I’ll shift the buttons again later on after wear and stretching a while? I do think that they’ll never quite make it to the real curves since the heels are lower and apparently women had much smaller ankles and calves back then? Last night we took a walk, and I found the boots comfortable. I’d also worn them as much as I could inside too. It appears that they are nearly as well constructed and durable as the Capezios? As far as I can see they look comparable. The heel is lower on these which is welcomed although it looks a little less pretty I guess. My feet are picky, and I get pain and blisters from all of my shoes it seems, but two walks have proven the Renoirs to be some of the best to jump into that I’ve ever worn. No hint of rubbing or blisters and no pain. Very comfortable indeed. This morning I spent performing button relocation surgery. The right is snug now, but I’ll have to adjust the left for equality. It seems that my left is a little narrower, which I knew, and the feel is not agreeable since I was afraid to take things in further than the other. The time spent was annoying, one or two hours, so I’m not too quickly adjusting now. They are as comfortable as can be and surpassed my expectations on that point. I do love them, but I’d be even more thrilled if American Duchess would make them in a style closer to the Can Can boots (curvier with the higher heel) and especially with the broguing and cherry colour of her new Oxfords. That would be incredible! The price is reasonable to me and a lot better than custom Capezios, and you can’t find real buttons anywhere else that I know of. 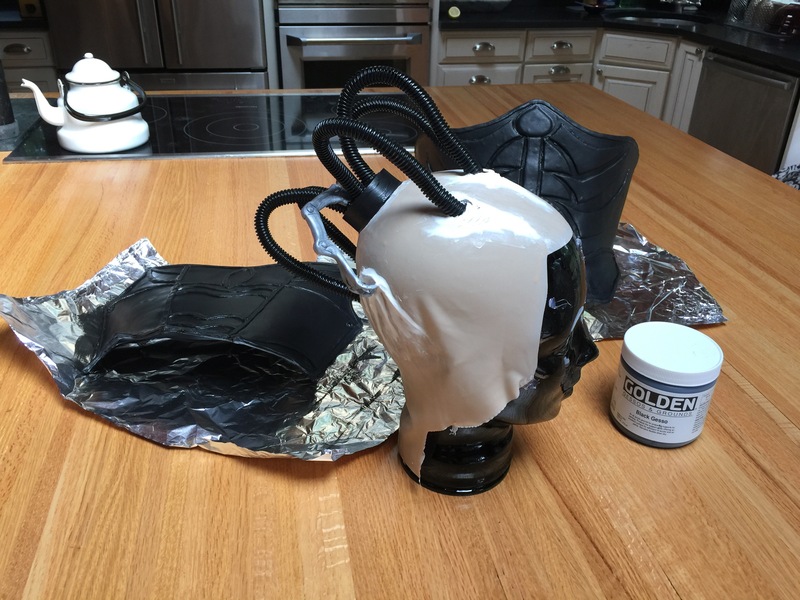 I’ll be having a cobbler rubberise the sole and heel, because they are a little slippery, and I know that the plastic heel cap thing is going to wear out like crazy. I cannot wait to see how these look after breaking in more! While I had no great idea for a costume I’ve been looking for an excuse to make something 19-teens-ish. I’m certain, after watching Downton Abbey this summer, that this is my favourite fashion period in all of history. Even before the show I was drawn to it and even based my wedding dress in the era, so I had some pieces that I could put together for this Halloween’s look. I used the old under-bust corset, a thrift store silk skirt that I’ve had for years, the fingerless gloves from our wedding, a leather mask from Etsy, and a silk chiffon wrap tunic that I made some years ago. I think it has a ‘teens look. At some point I’m certainly going to make at least a few good ‘teens pieces. A coat is a must too, like one (far right) in this fashion plate? Meanwhile, I am thrilled about some new shoes… L has pre-ordered REAL button boots for my birthday gift, and as soon as I have them I’ll be sharing photos and a review. (I Googled forever, but no one seems to have shared photos beyond those from the actual website or upon first arrival. I’d like to see what they look like with the buttons adjusted and all broken in, so I’ll have to be the one to put that online it seems.) I’d wanted to get a pair of my beloved can can boots, but they are really expensive and now only custom made as it turns out. (I realistically need an entire size larger than the pair that I’ve worn for more than ten years. They still look pretty good, after tours of Barcelona and NYC, but my feet grew…) Maybe another time, but I’m seriously excited to get my hands on actual button boots! Even when I was a little kid I wished I could have a pair like I saw in antique shops or worn by Shirley Temple in The Little Princess. OMG, the want. 😀 I already ordered a few antique button hooks, and I look forward to a post or two about the boots when they arrive and after a while. I’ve also gone ahead and received a pair of Edwardian shoes, but I have yet to adjust the buttons or anything. Unfortunately I don’t recall where I pulled this photo from, and when I tried doing a Google image search just now it didn’t bring me to the source. (Perhaps I didn’t search correctly? Google only led me to the definition of “female.” Weird.) I expect it was from the Mission New York event itself? Sorry to whoever ought to be credited, but thank you so much for taking the best shot that I have of the costume! Once again I failed to take decent photos for myself. 😦 This is a serious problem when I want to show my work and have crappy mirror selfies only. So. 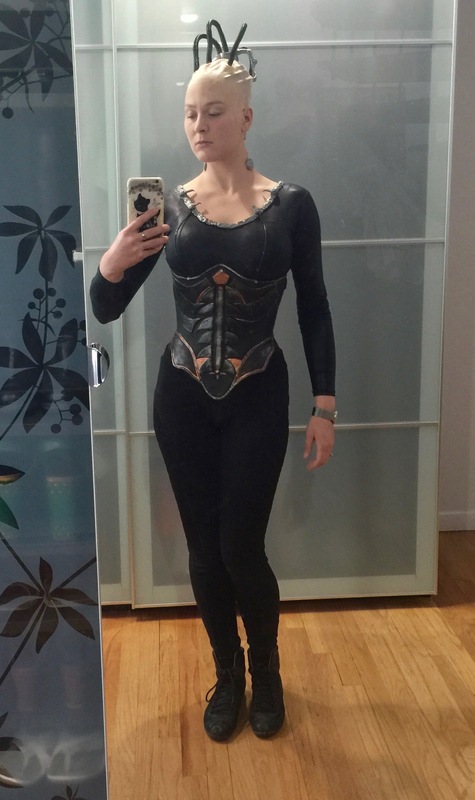 I made this Borg Queen costume at the end of August after vowing never again to wear such a costume after last Halloween. I’d made my first rendition for Halloween 2014 and thought it turned out great. I even won a contest for the first time! However, I barely had any photos of it. When Halloween rolled around last year I decided that I could re-use it easily enough, but I still didn’t end up taking great photos! Wtf? (The problem seems to be that L. rather dislikes taking photos, or taking the time to properly take photos, and also it always gets dark before I’m done putting everything on.) Anyway, the weight of the headpiece caused a massive headache, and the adhesive was unpleasant to remove, so I vowed never again. 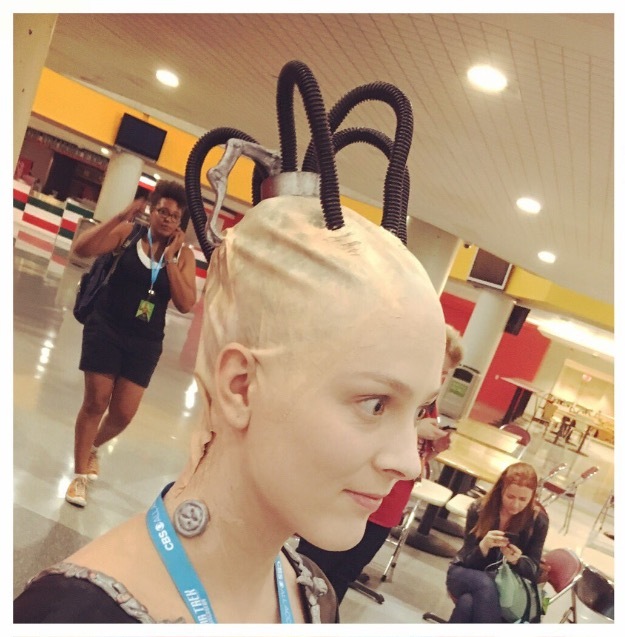 Then L. asked if I wanted to go to a Star Trek convention, and I simply couldn’t not try the Borg Queen again. At least I had enough experience that I knew I’d have just enough time and mostly which materials I needed. Even with the bald cap I knew what I was getting into. 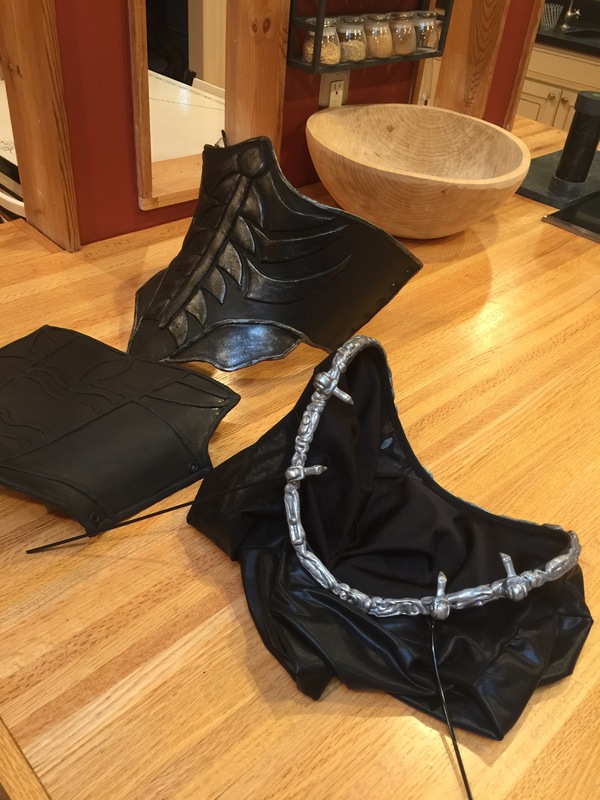 This post is going to be extremely long, but I hope you’ll enjoy seeing so much of the progression of this costume. In general the Borg seem like really fun costumes to tackle, but L. suggested I go straight for the queen saying that I resemble her enough to pull it off well. 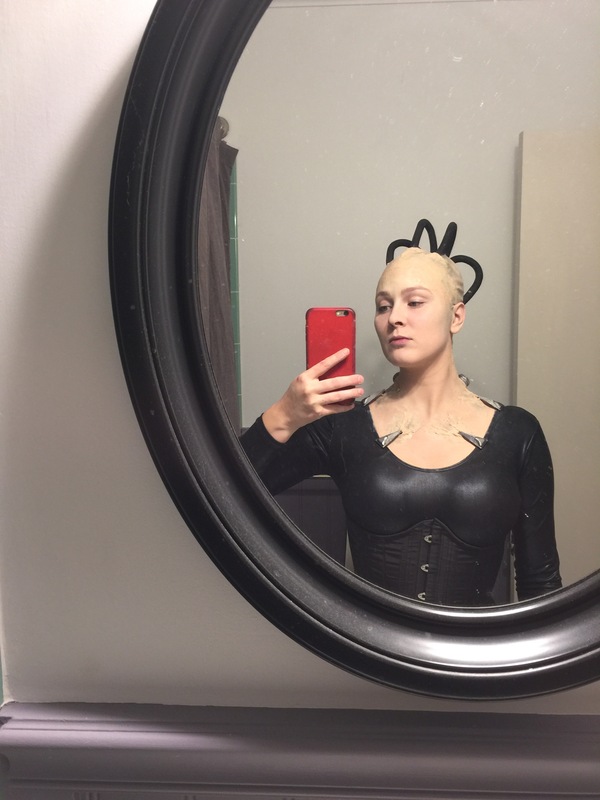 It would be really neat to do a drone costume, and perhaps easier in many ways, but I went into the unknown territory of bald caps and makeup. Yikes! 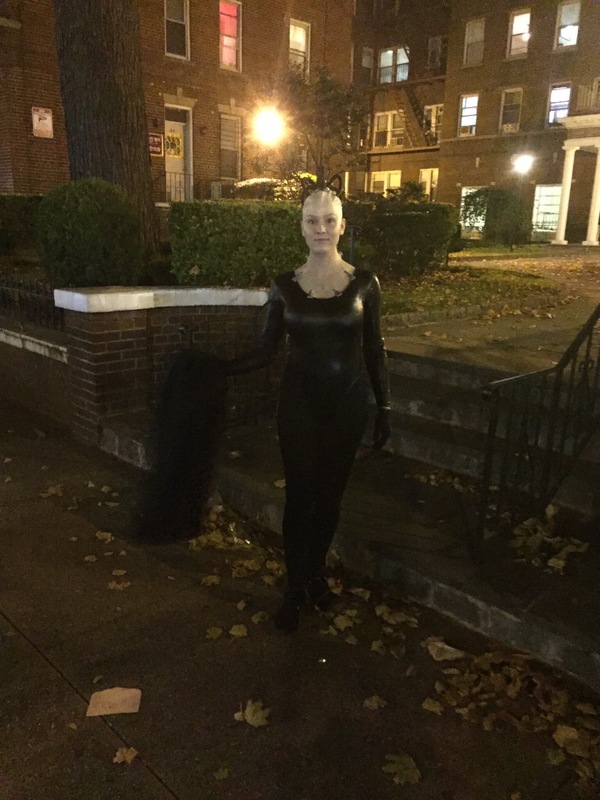 For Halloween 2014 there was so much trial and error. I probably spent twice as much as I needed to by trying materials and finding they didn’t work as planned. I also re-made several things over and over too. 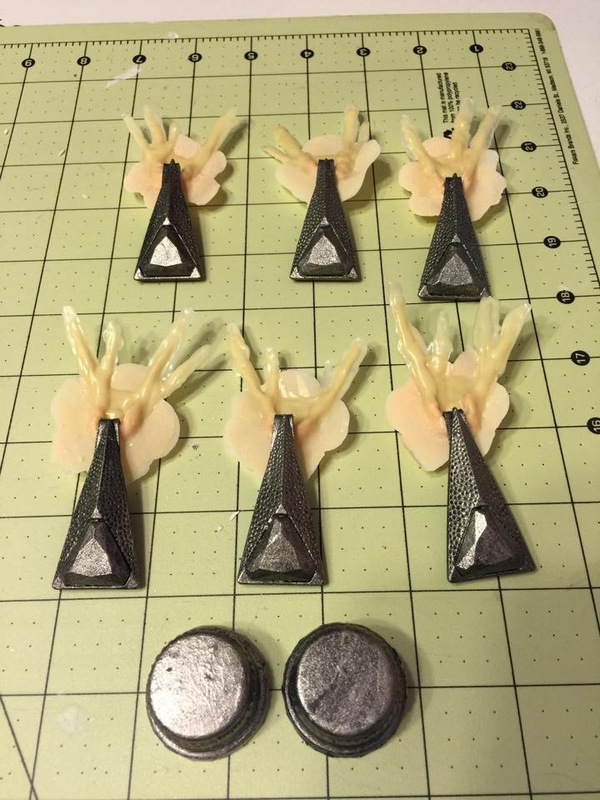 For example, I first attempted to sculpt with silicone from the hardware store, and it worked decently well… until I discovered that nothing would stick to this material (liquid latex in particular.) Another dead end was using bits of latex gloves for sculpting rippled skin. It looked good but wasn’t functional. 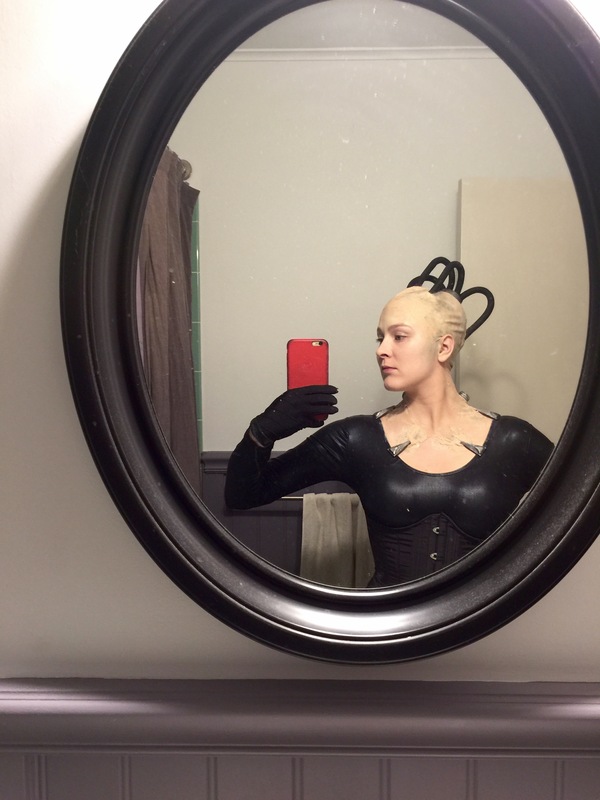 For this costume I used beads and picture hanging hooks for the neckline attachment, and I sculpted the pulled skin with liquid latex and bald cap sculpting ended up being done with latex painter’s caulk. Bottle caps made great neck bits, a cap from teflon tape, and some cable management coils were wonderful for the headpiece. I did research and purchased Prosaide (normal and a thicker formula) besides the liquid latex and bald cap as far as real FX supplies. Great stuff! 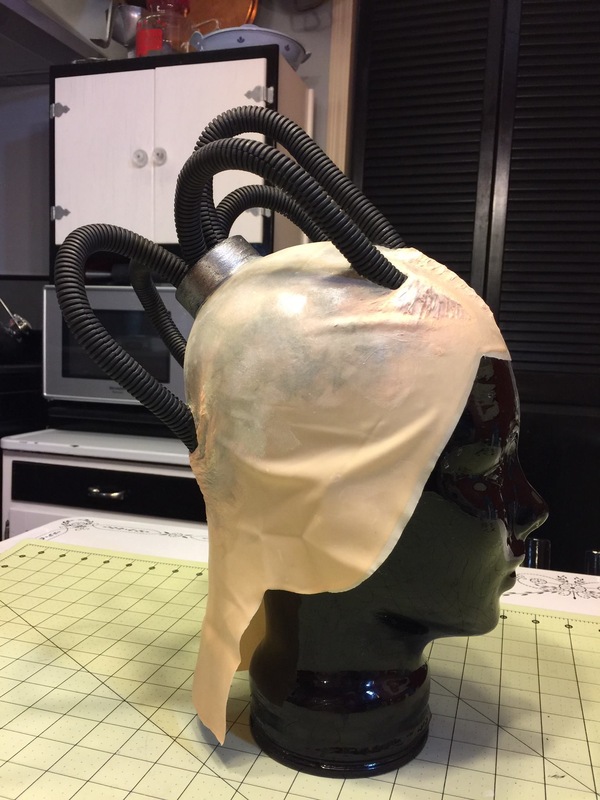 Last Halloween I only bought a bald cap, cut the sculpted portions off of the old one, and adhered them to the new cap (with Prosaide.) I re-used the neckline hooks, and I added a corset (that I made some years ago.) 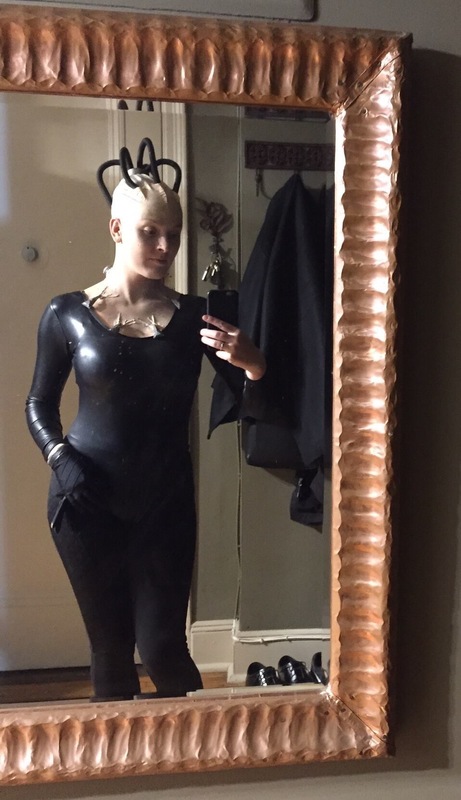 The makeup was not as smooth nor were the edges and transitions of latex. These are my best photos. :sigh: I wore it to hand out candy and then we had a few beers at our favourite neighbourhood bar. This time I wanted to go all out. I had to do something better for the torso and planned even on the legs and footwear to be amazing. However, time and creativity did not allow for as much as I dreamt. L. told me to expect all sorts of awesome costumes and competition at the convention and in the contest, so I tried really hard with this costume. I am proud of it although I see plenty of things that could have been done better. This time I can most likely even wear it again, but I do not have plans to. 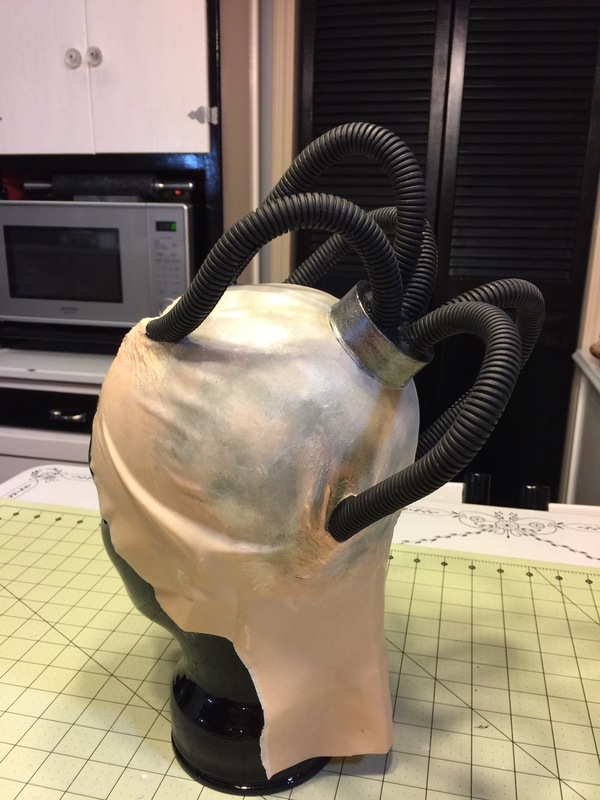 The first thing I worked on was the Borg Queen torso. Since I was using a new material it was the part I was most concerned about having time for, but it did go faster than I’d anticipated. To make her torso I laced my old corset onto my dress form to use as a base. I wanted to be certain of measurements, and this made the perfect sized form. My plan was to wear the corset underneath the costume also, because I didn’t want to bend and break something! It was not too difficult to sketch out a general shape on pattern paper, pinned onto the form, to use as a template to cut craft foam. 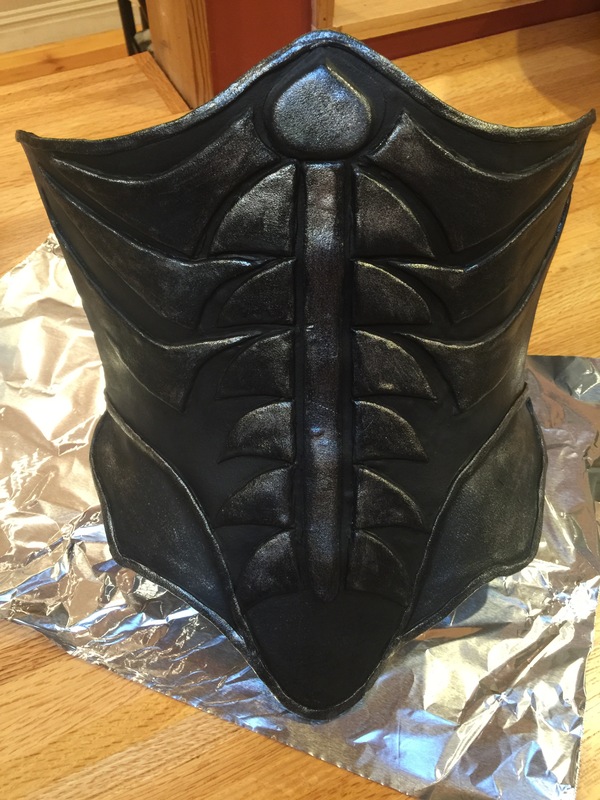 I bought two large pieces of black Worbla on eBay, and I sandwiched Worbla over craft foam to make the torso pieces. The process ended up killing my cheap heat gun (RIP) and was very uncomfortable for my fingers. Perhaps I am particularly wimpy in that regard (I have circulatory issues) or maybe I wasn’t patient and should have held the heat gun farther away? The Youtubers looked much happier when moulding it than I was. 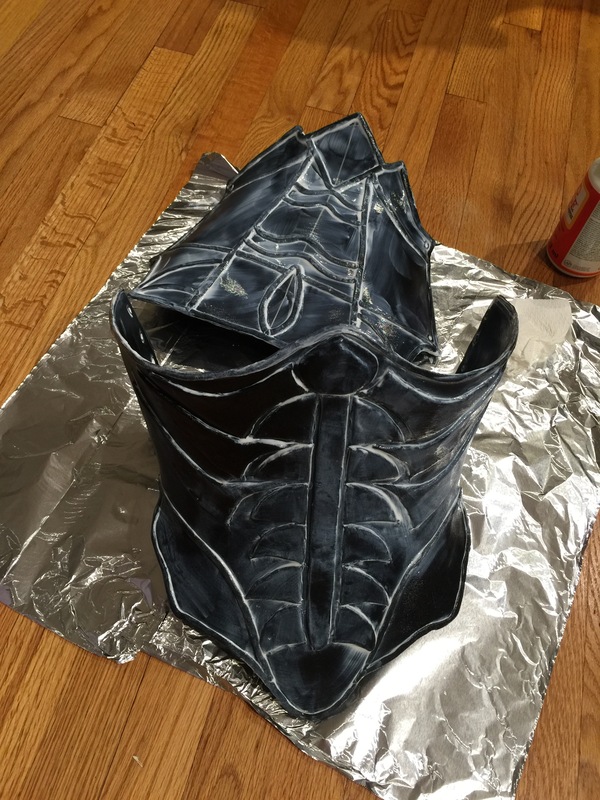 When the Worbla portion was all sculpted I began to work on the headpiece, because it must be done in layers and left to dry for days between. First, I glued a teflon tape cover in place with latex caulk and let it dry. Next, I hot glued the cable management coils into it, the other ends onto the cap, and filled the void with more caulk. 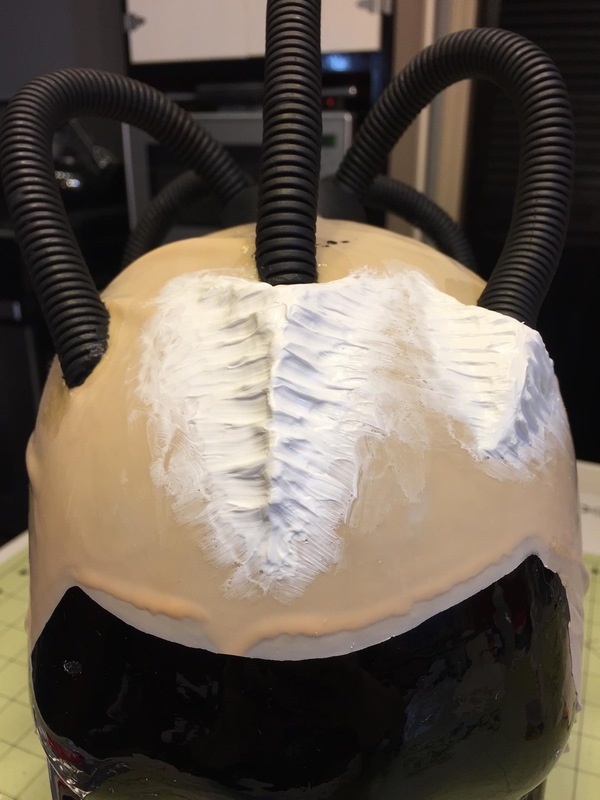 Caulk is perfect for sculpting the skin where the coils enter the skull, but it has to be done in two or three layers before doing the detail. You can see that I began sculpting the plastic parts with InstaMorph while the layers of caulk dried. It was nice to work with but also made my fingers somewhat uncomfortable. I wished I had tried this product long ago, because it was so perfect to use. 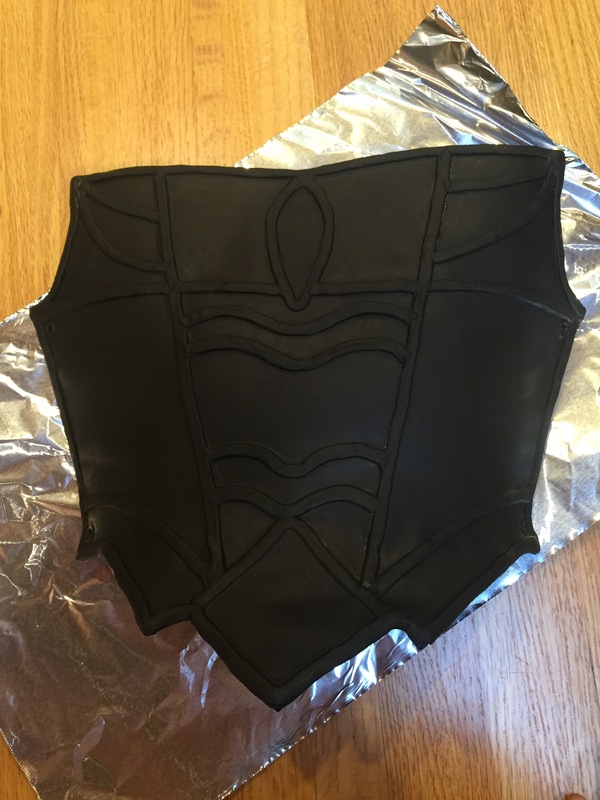 To attach the neckline stuff to the leotard I only had to heat it up and stick it on. It was really easy, but I accidentally melted a hole through the fabric in the back… so an extra bit was added not inspired by the real Borg Queen to cover it. The only other problem was that the plastic did not stretch to fit over my hips when dressing. I encountered the problem when in a rush to get ready! 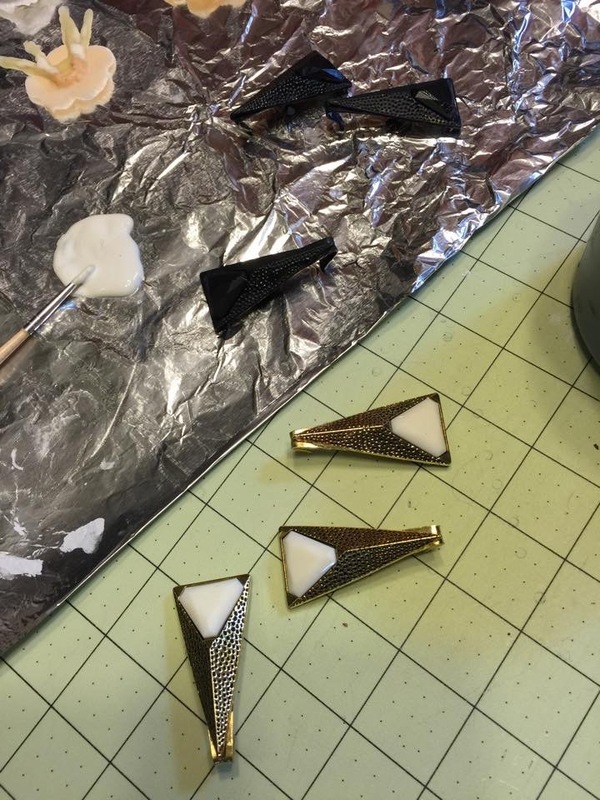 My solution was to keep pulling until it broke enough to put on, and then I contorted with the heat gun to re-stick the pieces that separated… while I wore it. 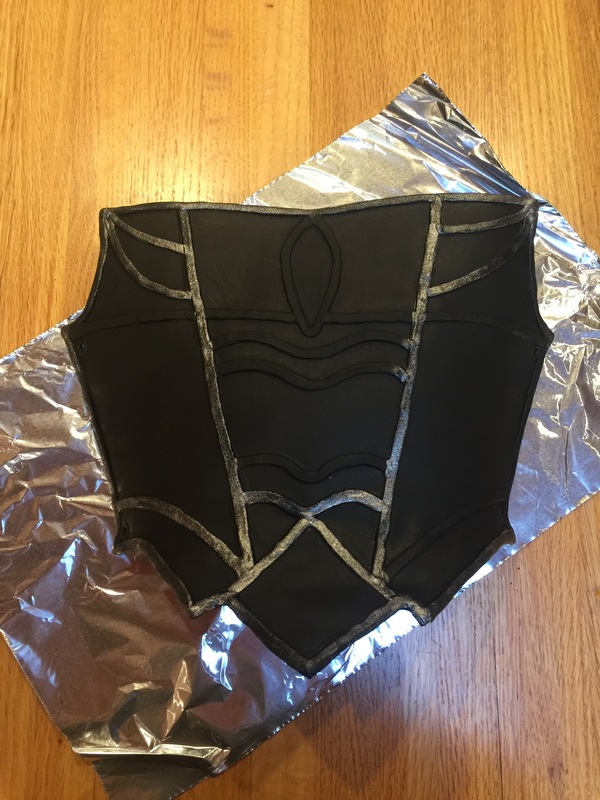 After making the torso with layers of Worbla and craft foam I wasn’t too certain the Worbla layers would stay together, and I saw a tutorial that advised brushing a layer of Elmer’s glue onto it before painting. Instead I used several thick layers of Modge Podge. Then I gessoed them, with black gesso to save steps, before painting the metallic effects. The shipping time for the iridescent paint caused worry, because it might arrive too late for the event, so I tried one with mica instead. I didn’t like it for this costume though. It was too shimmery rather than metallic, so I ended up coating the back section with gesso again and sending L. to Blick for the proper paint since he works nearby. The irritating thing is that I have plenty from past costume but could not find it ANYWHERE. I spent an entire day sorting through every box in the storage room and unpacking some that were still unopened from our move a year and a half past, but the paint is missing. L. saved the day by going to the store for me, and I also asked for a bottle of the copper paint too, because I’d noticed that the Borg Queen had bronze-red accents too that I now felt could not be ignored. Adding some warmer tones would really bring things to life, I thought. All done, aside from the makeup and assembly of course. I’d really wanted to make the legs look good too and bought a few types of metallic and black pearl fabric paint, but I couldn’t really figure out a way to apply it and not have problems. Finally I chickened out of trying, because I was afraid to ruin the leggings too soon before the convention. It is a shame though, because I don’t like that portion of the ensemble as a result. The convention was really something else. I did not realise just how much attention this costume would attract. It was surreal and amazing to experience. 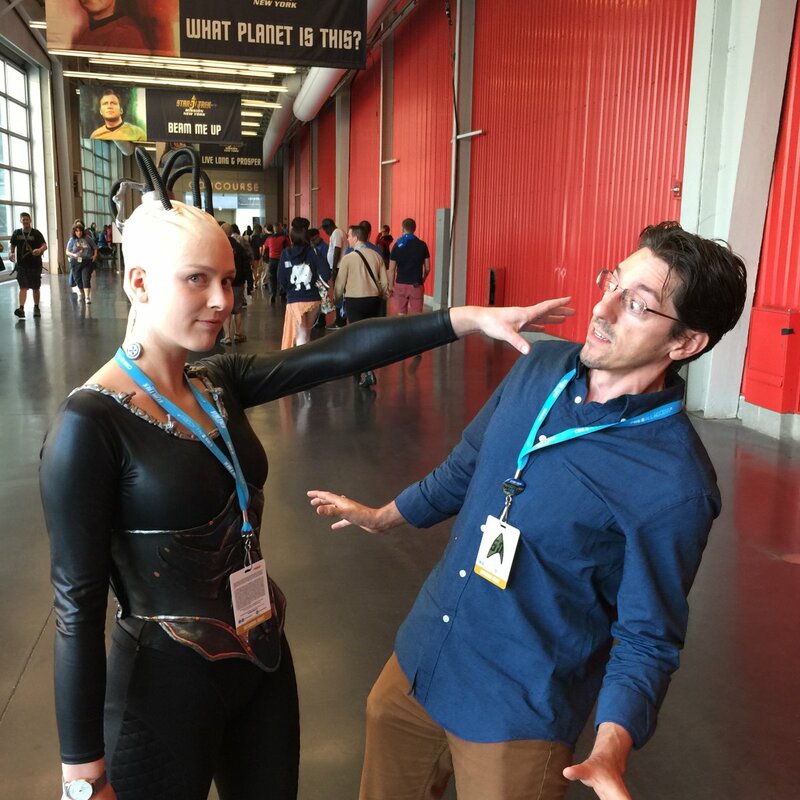 When we first arrived to the Javits Centre area I was almost worried we had the wrong place or day, because we didn’t see anyone dressed up at all. Even inside it was a bit echoey and empty when we entered, but we met up with our friend and found seats at the back of a panel event. along the way I received some smiles and stuff, but it wasn’t until the panel audience exited that I experienced the full effect. We were some of the first out of the door, being so close to the back, and before we could figure out where to go someone asked for a photo. Suddenly it was several people, many people, tens of cameras and phones ringed around me in a swarm. I wasn’t prepared at all, so it was really bizarre and overwhelming for a bit. I couldn’t decide how to smile, or not smile, and I’m sure the photos taken then showed a very awkward Borg. This kind of thing continued all day though, and very soon I was admittedly enjoying every second. 😀 L. and our friend S. kept joking about the fact that we couldn’t walk more than a few steps before being stopped again for more photos. I’d hoped to snag a bunch of them online, but only a couple popped up that I could find.